Pinxton No. 1 was actually sunk in 1788. In 1780 Reverend D Ewes Coke inherited former lands in Pinxton from Miss Sarah Lillyman. D'Ewes' mother and father died when he was quite young. The Cokes lived at Kirkby Old Hall (Sacheverell Hall) and were neighbours of the Lillymans. Following the death of his mother, D'Ewes father left to seek his fortune leaving young D'Ewes under the guardianship of Richard Lillyman at Brookhill Hall. When Sarah died in 1780 D 'Ewes inherited her estate, much of which had been in the ownership of the Cokes but was sold off, mainly to sitting tenants by D'Ewes grandfather. With his new found fortune D'Ewes formed Pinxton Collieries Company and sank Pinxton No. 1 (Sleights) Pit. 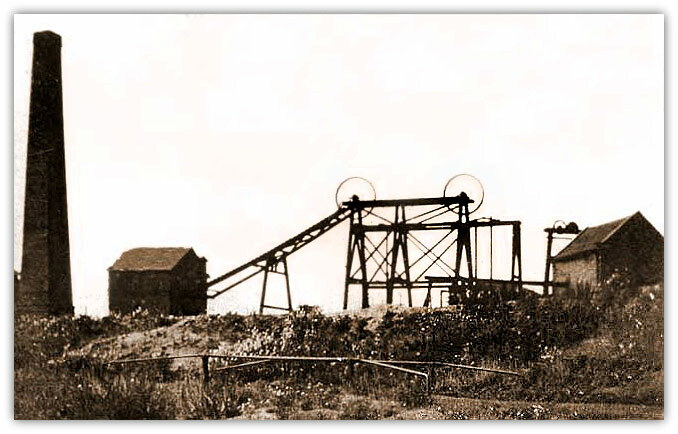 This was Pinxton's first deep mine. Shortly after he was involved in financing the Cromford Canal (including the Pinxton Branch) to get his coal to Leicester and the south of England. In 1795 his youngest son, John, was involved in the construction of the Pinxton Porcelain Factory. D'Ewes died in 1811. His son John was later (1816) in the development of the Mansfield Pinxton Railway. In 1852 a second shaft. No6 was sunk close to No.1 down to the deep soft seam which lay 20 yards above the deep hard. A new winder was installed using flat hemp rope to operate a cage in each shaft, which held two trams each holding up to 1 ton of coal. In 1856 a roadway was drove some 32 yards through faulted ground connecting the deep soft to the deep hard. No.2 pit was at the bottom of Slieghts Lane, this shaft was 130 yards deep and acted as the upcast, early ventilation was by the furnace method. In 1872 a steam engine driving a Waddle Fan was installed, and then in 1925 an electric fan was installed, No.1, No.3, No.6 and Brookhill shafts acting as the air intakes. No.2 ceased coal turning in 1947, after nationalisation, acting as the upcast shaft for Brookhill, and pumping water afterwards, until Brookhills closure in 1969. No.3 was 112 yards deep, it ceased winding coal in 1910 when Brookhill headings in the low main (Tupton) reached the No.3 low main reserves, the shaft being kept open as an air and escape shaft. A 20hp electric winder replaced the steam winder which was scrapped, the chimney was demolished in 1930, the shaft being filled during 1955 and the headgear being demolished in 1958. No.4 and No.5 shafts to the north of 2 + 3 were closed during 1860. 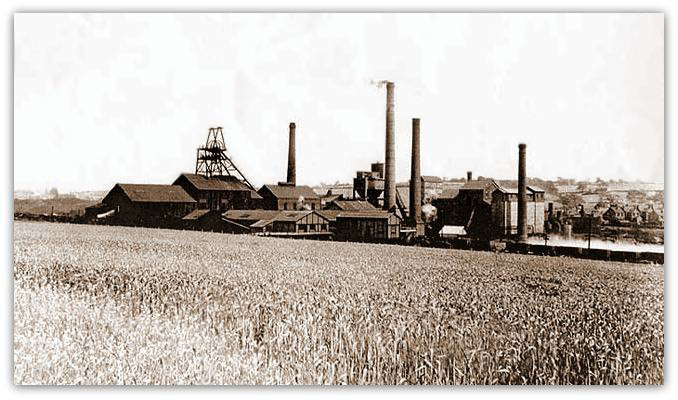 Brookhill Colliery was an extension to the Pinxton Collieries Company Pits, which in years to come would be the main centre for coal winding and surface coal facilities for all the Pinxton Pits. The sinking of Brookhill, about 200 yards west of Beaufit Lane, began in February 1908. The shaft was 16 feet in diameter and went down to the low main and blackshale seams, the sinking contract was awarded to Edward Ward from Selston, the price being £12-10-0 per yard. While sinking the seams passed through the Top Hard at 76 yards, Waterloo at 139 yards, deep soft at 273 yards, deep hard at 294 yards, low main at 345 yards and blackshale at 404 yards, final depth of shaft being 417 yards. The total payment to Edward Ward's son (Edward died during the sinking) being £5,862.00. The winding engine was constructed during September 1908, a modern screening plant was also constructed during this time. By September 1909 all scaffolding was removed from the head gear and the new winding house, new guide ropes were also installed. In September 1909 headings began in the low main and blackshale seams. The first 1000 tons of coal were turned on November 3rd 1910. The pinxton colliery rescue team were called into action for the first time at Brookhill when on April 19th, 1911 a fire occurred at the Waterloo pump motor, smoke entered the workings overcoming many men resulting in the rescue team being called into action.